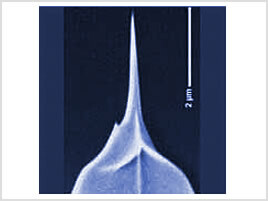 High aspect ratio (HAR) probes are based upon Bruker technology and made from Bruker TESP probes using focused ion beam milling techniques. The HAR process modifies the top portion of the tip to an aspect ratio of at least 5:1. 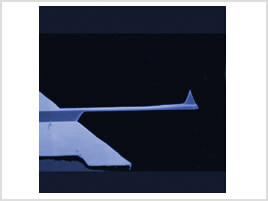 These probes are ideal for Tappingmode imaging on samples with tall/deep geometries, such as semiconductor trench imaging.